Lighting – When you’re renting out your holiday home, be aware that your guests may leave the lights on all the time, even when they’re busy spending the day at Disney World. One way you can reduce electric consumption is to install motion sensor light switches in all of the rooms. This allows the lights to come on manually or when someone enters the room. If there has been no movement in the room after 15 minutes, the sensors will automatically turn the lights off. Another way to save money is to replace existing incandescent and fluorescent lighting with energy efficient LED lights. Not only will LEDs save you money on your monthly electric bills, they will also help curb the cost of bulb replacements over time. Door Alarms – Vacation homes that come with their own private pool and patio make attractive rental units. But they also can lead to higher electricity bills since guests may be tempted to leave the back door open, allowing warm air to flow back into your nicely air conditioned home. That leads to unnecessary wear and tear on your A/C system. Curb that practice by installing a battery powered door alarm that delivers an annoying, ear piercing alart whenever the door is left open for a specified period of time. Programmable Thermostat – Many vacation guests have a bad habit of turning down the temperature on an air conditioning unit to 60 degrees F. (15 degrees Celsius), which can cause your electric bill to soar! If you’d like to prevent that from happening, install a programmable, lockable thermostat that will keep your guests from setting the temperature below what you allow. 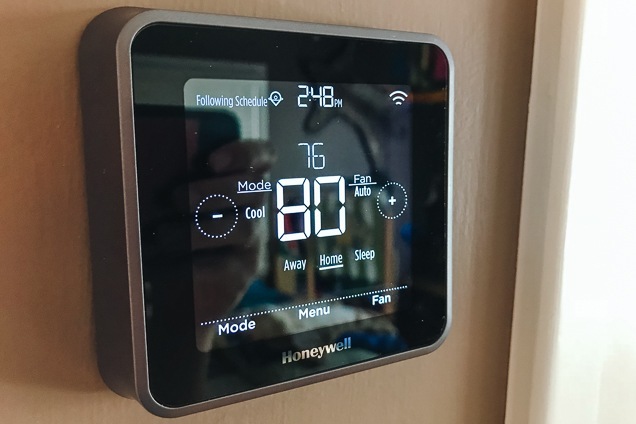 Some of the newer thermostats are also WiFi enabled, which means they can message you and your management company whenever a spike in energy consumption is detected. This is critical for spotting maintenance issues before they lead to costly emergency repairs. Lawn Irrigation Controls – Irrigation systems are used year-round in Florida and are critical for maintaining vacation home curb appeal. Since the grass gets cut year-round in Orlando, there’s a good chance that a mower could break sprinkler head. It’s a smart move to have your management company check the irrigation system for your holiday home each month to make sure everything works well, and that all zones are getting adequate coverage. Even one broken or clogged sprinkler head could cost you a lot of money in wasted water and dead grass. Consolidate Technology Services – Another way to save money on monthly costs is to bundle your cable, television and telephone services with one vendor. You can save as much as 60 percent off your monthly bills through this combination, as opposed to using separate vendors. When you buy a holiday home, your Vacay & Co agent can counsel you on the local companies that provide the best value. Smart TVs – Finally, consider replacing a convention television set for a Smart TV. These new devices feature Amazon TV, Apple TV, Netflix, Hulu and many other services that your guests probably already have accounts for, giving them more entertainment options at no added cost to you! Let the experts from Vacay & Co Real Estate help you find the perfect Orlando vacation home. We are the leading Central Florida real estate firm specializing in the sale of properties for use as a second home, investment, or both. Contact us today to kick start your vacation home purchase adventure. « Disney Skyliner Continues Testing: Could This Project Be Taking Flight Soon?